Needlebot’s research team has undertaken a series of benchmarking tests to demonstrate that its search technology can consistently lead to superior results when applied to search results from leading search engines such as Google and Yahoo. The basic methodology is to search for a word or phrase in Google or Yahoo and score the relevancy of the first 200 results returned from the search. These same results were then “fingerprinted” using Needlebot’s technology and re-ordered for relevancy. The number of relevant hits was then compared to the pre-ordered results. 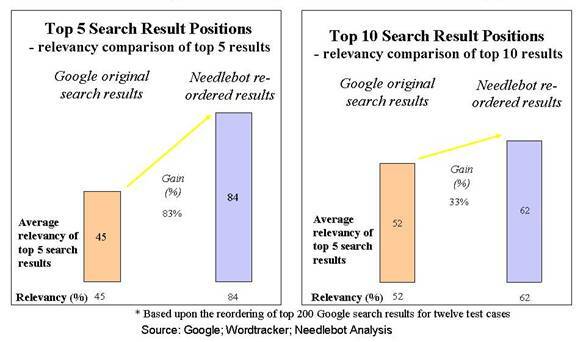 In the vast majority of cases, Needlebot’s reordered results were significantly more relevant and clearly demonstrated an improved search capability. The chart below is a graphic representation of how Needlebot’s technology can, by use of its proprietary algorithm, re-order Google's search results such that more relevant hits are moved forward in the listing order. 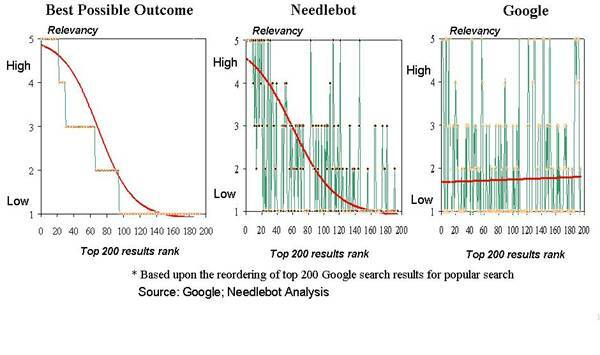 Key Observation - The distribution above shows that Needlebot’s re-ordered list has far more relevant results listed early on while Google’s distribution is flat, indicating that that relevant hits appear in a much more random order throughout the top 200 results.